The electric oil pump articles provides guidance and review about different types, qualities, durabilities, and prices. This pump is mainly used in automobiles to pressurize the oil in the engine and the lubricating system. They are powered by electric power. These pumps pressurize oils during starting of the vehicle, idling conditions and also supply oil in lubricating and cooling systems in the engine. The pump helps in reducing the wear and tear of the engine and increases the lifetime of the engine. They also reduce the fuel consumption of the engine. Lower fuel consumption leads to lower operation costs, lower pollution, higher efficiency, etc. Now let us look at the importance of the oil pump and their operation in engines for different purposes. Engine starting – When the engine is starting, more power is needed to start due to the oil pressure. And engine starts to wear due to its operation in dry condition. In order to avoid this problem, an electric oil pump is required to supply oil to the engine before starting. The electric oil pump turns off after the engine starts. These pumps help in avoiding wear & tear problems in the engine. Thus the engine`s life expectancy is increased and fuel consumption is lowered. Engine idling – In order to lower the fuel consumption, automobile companies are trying to turn off the engine during the idling conditions. Idling conditions refer to the condition where engine power is not needed for vehicle operation such as standing in the traffic or decelerating a slope in the road. During idling conditions, oil pumps are used to transfer oil to the engine and help to maintain the pressure in the engine. Hybrid vehicles – Hybrid vehicles use the combustion engines powered by electric power and pumps for operation. The electric air pumps can be used during the engine starting and idling conditions in the hybrid vehicles. Lubricating – they are used to circulate engine oil to the piston, bearing and camshafts in the engine. They also help in the cooling process. They are used in the clutch disengagement applications in various modern vehicles. The electric pump is the one of the main components of the engine and is used to supply oil to the moving parts of the engine. Now let us see the specifications to be considered while selecting them. Flow rate – the amount of oil required to flow through the engine system by the electric oil pump. Flow rate must be calculated considering the pressure to be developed, temperature and viscosity of the oil. The flow rate is expressed in terms of volume per unit time. The flow rate is measured in Gallons per minute (GPM). Oil pressure – The engine oil pressure is not provided by the pump. The pump only creates the flow of oil. When the oil flows between the clearances in the engine in the restricted area in the engine, the pressure is created. More oil flow creates more pressure. Electric oil pumps can be used to produce a pressure of more than 150psi easily. A pressure regulating valve is required to regulate the pressure. Pump screen – Pump screen are used to protect the engines from foreign materials and avoids them entering the engine. They are also used to pick up the oil from the bottom of the reservoir without any air molecules and recirculate them in the engine. 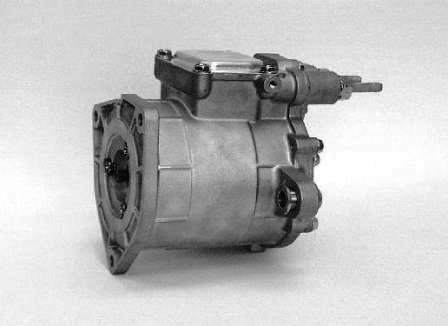 Pump priming – Oil pumps are made with close tolerances so most cases electric oil pumps are not self-priming type. It is advised to use suitable priming agents such as the thick oil or grease for priming of the oil pumps. Without priming agents, pumps will run dry and causes wear in the pump. Power – power is used to determine the amount of the flow required at the specified pressure. We have to select a pump according to our power requirement. Power is expressed in terms of Horse power (HP). Some of the main manufacturers of electric oil pump are Graco Inc. Nidec Corporation, Arientec Orion ltd., Flojet and SHURflo Pumps. Graco pumps are available for both on-road vehicles and off-road vehicles along with series progressive lubrication system. The come with different reservoir sizes and drive options. They have flow range options from 1 cu. In. to 14 cu. in. with max. operating pressure of 2000 psi. Nidec Corporation is one of the pioneers in the electric pump market and they supply electric oil pumps to both normal combustion systems and hybrid vehicle systems. Hybrid vehicle pumps require about 4 to 5 times the flow capacity and pressure requirements than the normal vehicles. They are inexpensive and best in terms of quality. SHURflo and Flojet make pumps in diaphragm model and used predominantly in Suzuki models. Their models do not pump hot oils.